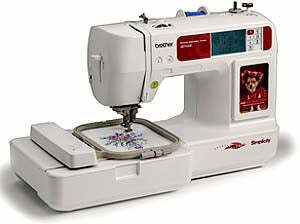 SB7050E has 120 embroidery designs, touch screen display, 4x4-inch area, thread cutter, USB port, lettering software. Add beautiful embellishments to your runway ready looks with the SB7050E embroidery machine. 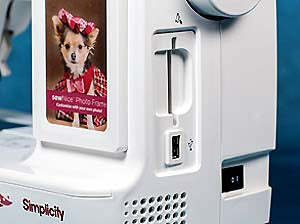 From the Simplicity® Limited Edition line by Brother™, this powerful machine is loaded with high-end features at a simply affordable price. Jazz up your wardrobe with the 70 built-in embroidery designs and 50designs on an included CD. You also have access to over 5,000 embroidery designs at iBroidery.com. Enjoy the easy to-use,large, back-lit LCD touch-screen display. The advanced needle threading system and push button thread cutter will make embroidery fun and easy. 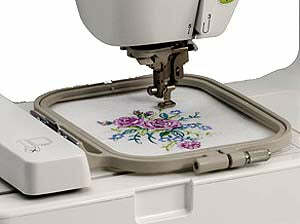 Let your creativity explode with simply personalized embroidery in one incredibly elegant machine. Back-lit LCD touch screen display. Maximum embroidery field of 4 inches x 4 inches. Included In The Hoop™ Machine EmbroideryTool Kit – $29.99 Value! Work Space (Height & Width) inches 3.9 x 5.3. Built-in Embroidery Designs (Non-License): 70 (Plus 50 on a CD). Included Accessory Feet: Embroidery foot. Other Included Accessories: embroidery arm, accessory bag with seam ripper, needle set, cleaning brush, screwdrivers (2), touch pen, spool caps (3), scissors, embroidery bobbin thread, bobbins (3), USB cable, power cord, English/Spanish operation manual. Included Embroidery Hoops: 1 (4 inches x 4 inches). Machine Dimensions (H x W x D): 15.2 inches x 14.9 inches x 20.3 inches.